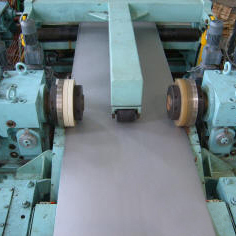 As different widths are frequently required during the production of metal strips, the strips must be trimmed after the rolling process and both the cutters must be movable electrically. The distance is now measured by difference measurement using laser sensors from Micro-Epsilon so that compliance with the target dimensions no longer has to be checked manually as was the case previously. Two optoNCDT sensors are used for this.